The record industry claimed he "wasn't black enough or white enough" to become famous - this is how the funk-rock superstar proved them wrong. A stone’s throw from the traffic thundering noisily past the iconic Arc de Triomphe lies an oasis of opulent calm. The Hotel Saint James Paris resembles a minor 19th-century palace, with a gated drive away from the bustle of the street. It’s just past noon on a hot day and Lenny Kravitz, wearing a black shirt and jeans with snakeskin shoes, is holding court. He’ll slip away for lunch at his nearby home – one of several scattered around the globe, including the private Bahamas beach where he keeps a caravan and a recording studio. Since 1993’s Are You Gonna Go My Way album turned him into an MTV staple, Kravitz’s music has often had a slick style suited to plush environments. But between takes on The Hunger Games: Catching Fire set (in which Kravitz plays Jennifer Lawrence’s stylist), the singer/multi-instrumentalist found himself writing gutsier music. “It brought me back to being a guy with a guitar, making raw music without much thought,” Kravitz says of his latest album, Strut, his tenth. His voice has the grit which made his early singing recall Al Green, but his words come out even and easy. Recorded in his Bahamas hideaway, with Kravitz producing and playing everything, Strut has a polish by legendary mixer Bob Clearmountain but the most focused rock energy in years. Recording it reminded Kravitz of his feelings as he first started making music. So he’s ready to look back to the eclectic albums with which he began. 1989’s Let Love Rule and 1991’s Mama Said, recorded on vintage equipment and influenced by classic rock and soul from the late 60s and early 70s, influenced the Black Crowes and Guns N’ Roses; they also led to Kravitz’s befriending by older rockers from Bowie and Jagger to Kiss and Aerosmith. Almost since his birth in 1964 there was something of the golden boy about Kravitz. His Bahamian-American actress mother, Roxie Roker, a star in 70s sitcom The Jeffersons, took her son to shows and gigs. Father Sy Kravitz was a Jewish-American TV producer and part-time jazz promoter. Giants of the black artistic world were house guests as Kravitz grew up in New York; jazz great Duke Ellington played Happy Birthday to five-year-old Lenny. By 1987 he was back in NY with girlfriend Lisa Bonet (above, with Kravitz), who starred in The Cosby Show. The globally famous Bonet and her unknown boyfriend married that year. 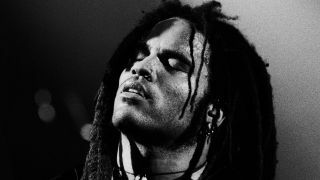 After eight years of struggle he ceased to be Lenny Kravitz, answering to ‘Romeo Blue’. Does it bug Kravitz that, as it has been since his debut, black radio in the US still won’t touch him? Is it disappointing that he’s still seen as unusual in playing rock; as if it’s assumed to be white music? It was at a studio in a disused factory in Hoboken, NJ that Kravitz found a kindred spirit. “Henry Hirsch came from New York City,” he explains. “He was a keyboard player who’d gone to Germany and had a couple of hits, and he then learned how to engineer, and had a very unorthodox technique, really raw. I came to his studio on the waterfront with another band I was playing with, and he and I saw things eye to eye. I ended up leaving that band to do my own thing. That was Let Love Rule. Kravitz wasn’t as alone as his label supposed. Guns N’ Roses had recently relaunched Zep-style guitar aggro and sent it to the top of the charts. The Stone Roses mixed acid house with The Beatles. Dylan, Lou Reed and Neil Young returned from the wilderness with great new albums, and ‘retro’ ruled. Kravitz was by now signed to the powerful agents CAA. He’d never played a rock gig. But after a brief warm-up in the clubs he supported Tom Petty, Bowie, Dylan and The Cult. He’d found his golden touch. Veteran rockers were delighted to hook up with a young star indebted to their music, even if some of the meetings were odd. “Dylan was in his underwear,” says Kravitz. “His wardrobe person was ironing his pants.” He became a friend though, along with Bowie and Jagger. “Mick came backstage on my Mama Said tour, here in Paris. I said: ‘Mick, man, since you’re here, why don’t we do No Expectations from Beggars Banquet tonight?’ We started working it out on guitars in the dressing room, and here I am, at my show, doing Stones tunes with Mick Jagger. You meet people that taught you, and now you’re playing with them. Kravitz returned to Hoboken to follow up Let Love Rule. But his life had taken a disastrous turn. Amid denied rumours of an affair with Madonna (for whom he co-wrote UK No.1 Justify My Love), he and Bonet separated. Kravitz responded with a break-up album. It Ain’t Over Till It’s Over didn’t have its intended effect – separation turned to divorce in 1993. But it lifted Mama Said into the US Top 40 and UK Top 10. It laid the foundation for Are You Gonna Go My Way, and the rest of Kravitz’s career. Now, the man serenaded as a child by Duke Ellington records in his own studio, on his own beach. Does that make any difference?